Curried pumpkin soup is one of my favourite soups to eat in the fall. I don’t eat it any other time of year, when I come to think of it, but when the pumpkin are ready and those leaves are falling from the trees? Fry the onions in 1 tbsp butter until soft. Set aside.In a large pot, mix 2 tablespoons butter and flour and melt them together, like you would do for a white sauce base. Slowly add the broth to the flour mixture, stirring slowly and steadily so that there are no lumps. Add in until all the broth is in and the liquid is smooth. Stir in the curry, cream, brown sugar and soy. Simmer on low heat (cream based soups can burn easily) until the onions are soup tender and ready. If you want, puree the soup so that the onions are incorporated smoothly. 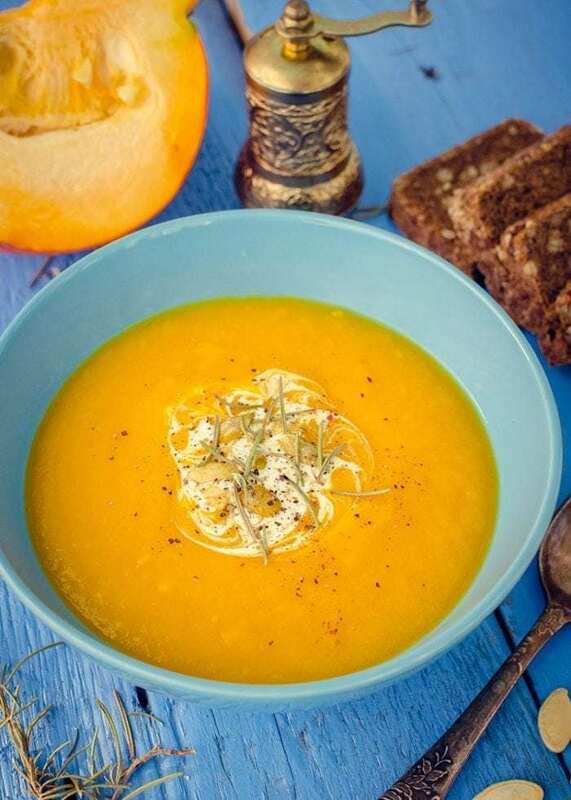 With a few simple changes, this pumpkin soup can be dairy free easily and still be delicious. If you don’t like curry, you can absolutely leave it out of this recipe and make a plain pumpkin soup. You can use fresh roasted pumpkin as well. To prevent the soup from curdling, whisk half a cup of the hot soup into the cream completely, THEN whisk it into the soup! This is called tempering. My son will eat this now, because as long as it doesn’t have meat he will usually eat it. And curry? That kid LOVES anything curry, so he’s on board. The other two? Pffft. What can I say. There’s just no accounting for taste sometimes. How can you not love a good curried pumpkin soup? Curried pumpkin soup! 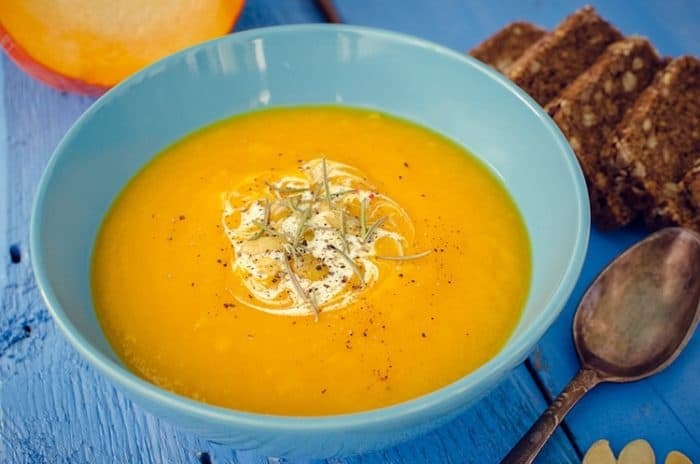 This decadent soup is perfect for fall with it's slight hint of curry and wonderful pumpkin taste! Fry the onions in 1 tbsp butter until soft. Set aside. In a large pot, mix 2 tablespoons butter and flour and melt them together, like you would do for a white sauce base. Slowly add the broth to the flour mixture, stirring slowly and steadily so that there are no lumps. Add in until all the broth is in and the liquid is smooth. Stir in the curry, brown sugar and soy. Simmer on low heat until the onions are soup tender and ready. If you want, puree the soup so that the onions are incorporated smoothly. Serve topped with extra cream, a swirl of sour cream and pepitas if wanted. This is one of my very favourite soups ever ! I have made a similar one and it is really yummy, nice with a bit of smoked sausage in as well. Let me know what you think!! Curried pumpkin is one of my favorites!! Ooh… was going to check your site for soup recipes. I have a work soup day… this may be the winner! Vegetables are eaten in a variety of ways, as part of main meals and as snacks. I am trying this tonight, I just don’t get one of the steps, you say to just add enough vegetable stock to the flour/butter mixture until it is thick – in the picture it looks like you added only a few tablespoons. Around how much stock do you actually need? and if it’s so little, is it necessary to add the 4 cups? Also, how many servings does this make? Thanks! I can’t wait to try this. Hey, mix it in before the cream goes in, to thin it out. Thanks for catching that, I hope you enjoy it, it’s one of our favorites! How do I make it with fresh pumpkin? Because it looks delicious and I am a pumpkin soup fan! Chop up and steam/boil the pumpkin until it’s soft, then puree it. You need 28 OZ. I do whole pumpkins like this and freeze baggies of puree, lasts me all winter for baking! Mmm. This sounds delicious!! I must say..GREAT pictures!! !